"It was such a nice surprise to see the total sales from the estate sale. Let me take a moment to let you know how happy we are that we chose you to run the sale. From the first moment we met you and Jim and your crew, we knew you were the right people to handle my lifelong "treasures." Each and everyone of you from Marilyn and Amber and the other people who were there to the guys from the Salvation Army were very respectful to us and our belongings. They obviously know how hard it is for a family let go of personal things that have meant so much to them through the years. Amber did such a great job Wednesday and I couldn't believe she cleaned up and vacuumed too! I can't say enough about all of you. You truly made a very difficult situation much easier to get through. If you ever need a recommendation please do not hesitate to let me know." "They were helpful and sensitive. With their help, the family home is cleared out, clean, and ready for possible sale. The check for the sale proceeds surpassed our expectations!" "Mary Kay and James are very easy to work with and I felt they were very thorough. They have a real knowledge and feel of what items will draw people to the sale, how to display everything, they research items for their true value, and they have a big following of people familiar with their work. They contact people who might be interested in certain items you have available as well, which can lead to even more success to your efforts." "Fortunately for me, I was given the name of Mary Kay and James of The Ageless Treasure. I contacted them and they were extremely flexible in working with me in setting up a time to come and review the estate. Mary Kay and James were very compassionate and understanding to the difficulty of this painful situation. They explained how the sale would work from start to finish. They answered every question I had and were willing to give me as much time as I needed to discuss the process. I immediately knew they were honest and hard-working people and the ones who would conduct my sale." 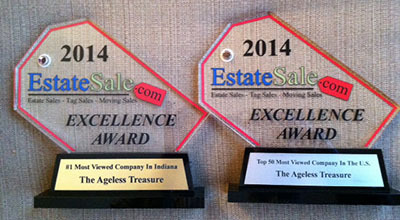 "The sale process began with The Ageless Treasure setting up for the sale. In our case, it was a home we had 50+ years of accumulation. Mary Kay and James treated all items in the home with care and dignity. They knew that these items were our childhood memories and conducted themselves in such a professional, yet compassionate manner. If they discovered an item that was clearly of a personal nature, such as old school papers, drawings, etc. they put those items to the side and made sure that we were given them." "On a scale from 1 to 10. The Ageless Treasure gets an 11. I was extremely satisfied and am willing to discuss my satisfaction with anyone." "What helped me pick them (and what was most helpful in the long run) was their positive and unflagging "We Can Do It" spirit, as well as their sensitivity to the family's loss at the same time." "Northwest Indiana, Chicago's South Suburbs, and Chicago's South Loop Leading Estate Sale Company." No estate too small or too large. Whether you are looking to liquidate the contents of an estate, need a moving sale or a going out of business sale, The Ageless Treasure is your answer. If you feel you do not have enough for sale or can not have a sale in a condo or retirement home? Contact us we also conduct off-site estate sales. Our professional, kind, compassionate staff will handle all the details for you, from organizing and displaying all your items, to pricing and obtaining the proper permits. This will minimize the workload for the family, executor or conservator. If you are liquidating, it can be difficult and emotional. We can assist by conducting an on site professional estate sale for you. There are no up front costs for our services. We are insured. Our experience, background and knowledge leads to having a great, successful sale.